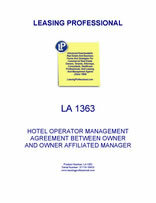 This hotel operator management agreement is appropriate for an arrangement where a management affiliate of the hotel owner will manage one or more hotel properties. The affiliate is designated as an independent contractor, and has general management authorities for the properties. 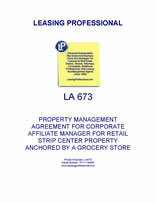 All costs and expenses incurred by the operator are to be paid by the owner, and the operator will receive a specified management fee subject to a cap of a percentage of annual gross revenues.